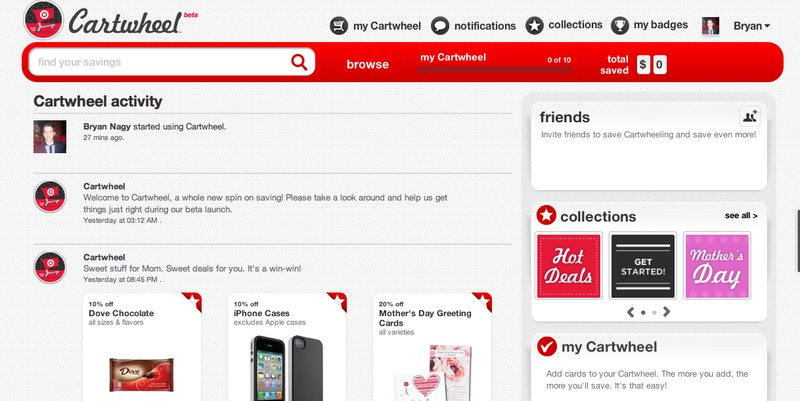 Target has launched a new social coupon strategy with a beta website called Cartwheel. 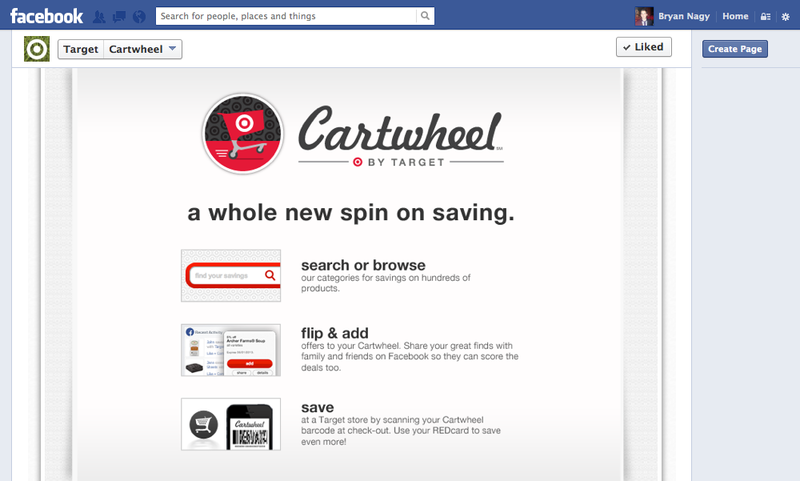 Tying into Facebook, Cartwheel provides social-oriented discounts and savings at Target stores. The move makes it a sort-of e-commerce partnership between Target and Facebook. The partnership is something Facebook has been vying to make successful with other brands. To actually use the Cartwheel product, connect Cartwheel with your Facebook account. The purpose of this is to connect with friends to share your favorite products and deals. Depending on your privacy settings, these deals are then shared with your friends on Facebook (such as “Jane selected a Target Cartwheel offer on Target bath towels.” This is where the social aspect of the tool comes into play. At the checkout, present a printout of your Cartwheel or barcode on your mobile device to get the savings. Think of it as the latest way to get Target coupons- no more clipping Sunday circulars. Given that Target’s Cartwheel ties directly into Facebook, Target has spent a heft amount of time promoting the site on its Facebook page. 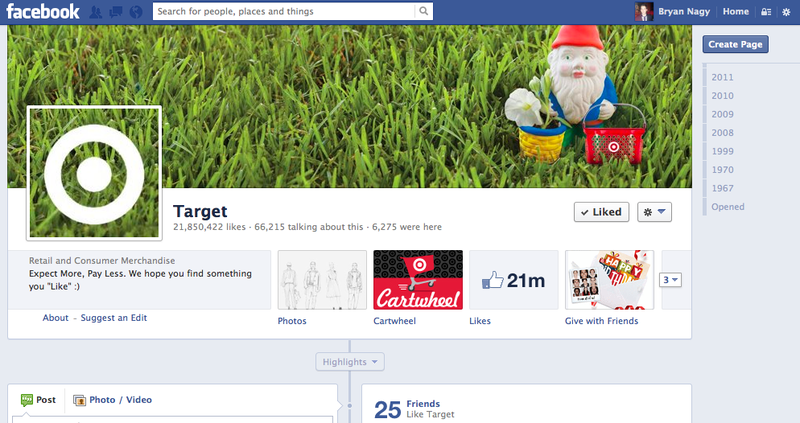 In fact, it even has an entire section of their Facebook page dedicated to Cartwheel. Target’s Cartwheel is a peak at how brands may be using e-commerce in the future. For one, Cartwheel offers consumers the deals and coupons they want at the touch of a button, without the hassle of getting a weekend newspaper or scouring the internet for sales. In one place, members can find sales on the products they love at Target. With its social Facebook connection, users see what their friends are planning on saving on and purchasing at Target. Given the social context, a user is likely more apt to try something new from Target, or be alerted of a sale on a item they already love. Finally, Target’s Cartwheel doesn’t just drive online traffic. It drives users back into the Target brick and mortar store, something retailers have been struggling with given the rising popularity of online shopping. As members visit a Target store, the chances they make unexpected purchases will likely increase as well (“I’m already here, so why not also pick up this nice lamp, or some extra groceries for this week?”). Though it is a small experiment and has received negative press from some, it is an interesting test at a new way of looking at e-commerce.